Dr Yam is former Cluster Chief Executive of the Hospital Authority’s Hong Kong East Cluster and Hospital Chief Executive of Pamela Youde Nethersole Eastern Hospital (PYNEH) and is now Consultant of PYNEH. She is best known for her leadership of the PYNEH medical team during the Severe Acute Respiratory Syndrome (SARS) outbreak in 2003. 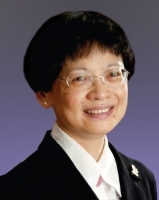 Dr Yam was awarded a Bronze Bauhinia Star by the HKSAR Government in 2004 in recognition of her contributions to public health and community services.